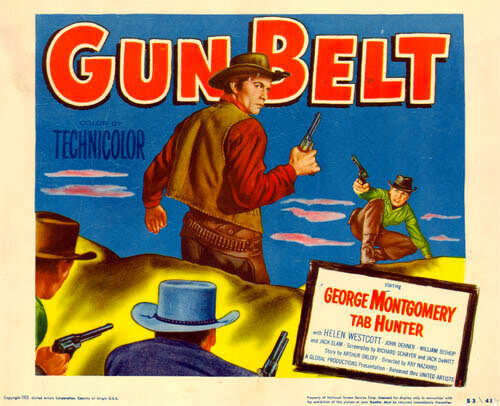 I decided that one good George Montgomery film deserved another, and since I really enjoyed ROBBERS' ROOST (1955), I next moved on to watching Montgomery in GUN BELT (1953). I think I liked ROBBERS' ROOST a little better, but I found GUN BELT quite an enjoyable 77 minutes. Like ROBBERS' ROOST, GUN BELT is one of those movies with a great '50s Western cast, in this case including John Dehner, Douglas Kennedy, William Bishop, Jack Elam, and James Millican (good as a soft-spoken, confident Wyatt Earp). Familiar faces like Lane Chandler, Byron Foulger, Syd Saylor, and Chuck Roberson are also in the movie. Montgomery plays Billy Ringo, a one-time outlaw who hung up his guns in favor of a respectable life as a struggling rancher. He's engaged to Arlene (Helen Westcott), and he's also raising his nephew Chip (Tab Hunter). Chip's father Matt (Dehner) is serving time and goes "over the wall," setting up a bank robbery as soon as he escapes. A not-so-loving brother, Matt manages to frame Billy for the robbery. Matters go from bad to worse when Billy kills Matt in self-defense and Chip turns against Billy. Billy's suddenly got a whole lot of problems on his hands; seeing as how the townspeople are ready to hang him, he goes on the run with the intent of delivering the bad guys to Marshal Earp (Millican) and clearing his name. This is a fast-paced film with Montgomery once more quite appealing as a man who handles what could be unbearable pressures with grace and even confidence. He develops a plan to solve the problem, and by golly, that plan is going to work. He certainly has inspiration in the form of lovely Arlene, knowing that he will be marrying her immediately if he can stay alive and out of jail! One of the things I really liked about GUN BELT is that the movie didn't waste time with the hero and heroine misunderstanding one another, which can be a boring and predictable source of conflict. It would have been easy for the filmmakers to depict Arlene temporarily losing faith in Billy and believing he's gone back to his outlaw past. Instead the movie depicts a couple of mature grownups who have come to know each other well and developed an implicit trust; Billy explains to Arlene what has happened, she accepts what he says as the truth, and then they work together to solve his predicament. In the supporting cast, Dehner is always a strong contributor to any film, and Kennedy, playing one of the bank robbers, is also a good actor. I liked Millican's take on Wyatt Earp, and he and Billy have a nice rapport. The movie's allusions to real people are a bit curious, as while Wyatt and his brother Virgil (Bruce Cowling) are characters, Bishop's character is called Ike Clinton rather than Ike Clanton. Wonder why? The only weak link in the film actingwise is young Tab Hunter. This was Hunter's third film, following a small role in THE LAWLESS (1950) and then starring in ISLAND OF DESIRE (1952) opposite Linda Darnell. In Hunter's defense, I'm told by a family member who has a slight acquaintance with him that Tab is a very nice guy, but back in 1953, at least, Tab was simply not a believable actor. He was 21 when this was made and sticks out amidst the cast of pros, the only one who's not the character, but a guy trying to figure out how to say his lines and what to do in front of a camera. I haven't seen many Hunter films, but hopefully he took advantage of the opportunity to learn from his fellow cast members' decades of combined experience and gave stronger performances later in his career. 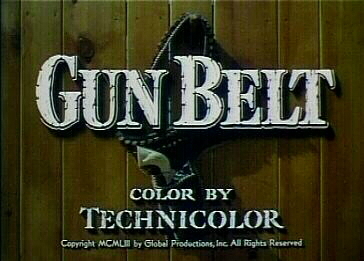 GUN BELT was directed by Ray Nazarro. It was filmed by W. Howard Greene at locations including the Iverson Ranch. I think I might have recognized the hotel from Randolph Scott's later DECISION AT SUNDOWN (1957) but am not certain. 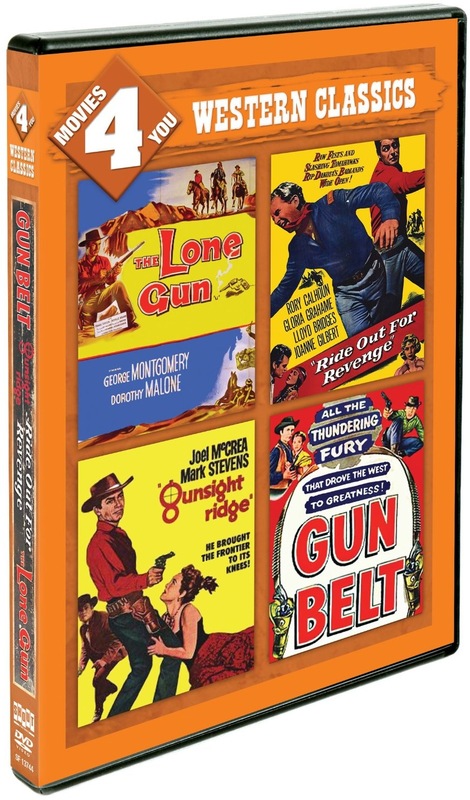 GUN BELT is available in an inexpensive four-film Western DVD set which came out earlier this year; the set contains two Montgomery films, one Rory Calhoun film, and one Joel McCrea movie all on a single disc. I'd love to see similar sets with additional Western titles come out in the future. The DVD print had an odd purplish tinge in a couple of scenes, which seemed like perhaps it could have been a DVD problem rather than a print defect, but other than that, it was more than acceptable. 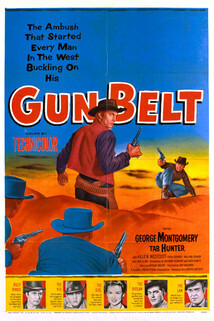 GUN BELT has also been shown in the past on Encore Westerns Channel, so it may show up there again one day. 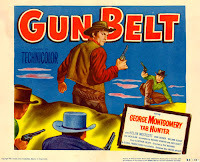 GUN BELT is a good example of the kind of solid, capably made Western entertainment that Hollywood once turned out on a regular basis. I enjoyed it, and I'm sure I'll be taking another look at it again at some point in the future. Tab Hunter defintely got better. At this point, he was inexperienced, a male ingenue given leads for his presumed good looks. This happened to many actors and generally they worked to get better and did. By late in the 50s, the time of GUNMAN'S WALK (especially), LAFAYETTE ESCADRILLE and THAT KIND OF WOMAN, he could be and was a very effective actor and those roles were not easy. James Millican again playing Wyatt Earp, though it's a character based on Earp and given another name, as Rory Calhoun plays Doc Holliday in the same movie under another name too, and the opening is another version of the gunfight at the O.K. Corral. 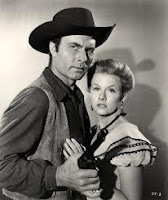 Millican was a wonderful actor-I don't know if you've seen his last movie yet, RED SUNDOWN (also with Calhoun)in which he has a great role and is outstanding. Thanks so much for this feedback, Blake! I haven't seen any of the Hunter movies you list so I definitely have some catching up to do here. Glad that you feel he did improve as time went on. How interesting Millican played Earp (or a maybe I should say an Earp "type") in another movie! I'm really looking forward to checking out DAWN AT SOCORRO in that TCM Vault Westerns set. Millican first came to my attention in a little Western I really enjoyed, COW COUNTRY. I was sorry to learn at that time that although he had a long film career, he died pretty young. I recorded RED SUNDOWN when it was on Encore Westerns and will definitely be checking that one out too! Thanks for all the interesting feedback!